If you’ve ever watched YouTube on the big screen, chances are it was a letdown with all the clumsy navigation and content discovery problems. That may not be the case for long — unless you have an Apple TV. 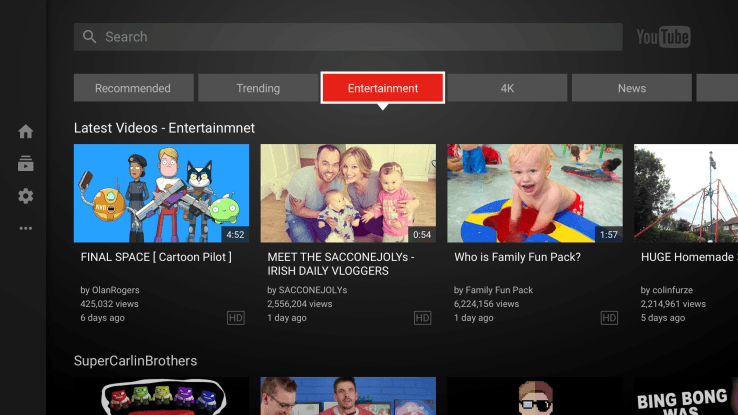 Google is rolling out an updated YouTube app for its various TV presences, save for the Apple TV. It focuses more on content discovery rather than trying to recreate the desktop or mobile experience for the large screen. Categories have been shoved off to the side, while a navigation bar up top has categories like ‘recommended’ or ‘news.’ It’s a shift away from the clumsy catch-all for the living room — and a smart move by Google. And if you have a fancy 4K TV — and a set-top box that can stream it — there’s even a category for that. Huzzah! As with most Google-y rollouts, this is limited to the US for now. It also sidesteps Apple TV, though there may be some design issues Google has to overcome first… and Apple TV doesn’t stream in 4K, so that header will likely be pulled.